Basically, the PC-1245 was a low-cost version of the PC-1251. The following features were affected: First, it had only 2.2 KB RAM instead of 4 KB, thus only 1486 bytes were available for programming. Second, the display provided only 16 characters instead of 24. Third, the RESERVE mode, which had allowed to assign BASIC commands or functions to 18 of the alphanumeric keys, had been eliminated. Instead, these keys were assigned BASIC shortcuts for easier program entering. As a cosmetical difference, the colour scheme of the keyboard had been reversed, that is the alphanumeric part was brown and the numeric keypad grey for the PC-1245. Internally, the electronics were more or less the same, except for an updated ROM chip and the eliminated RAM chip. The SC61860 microprocessor, the display driver chip SC43536, the LH532920 ROM and one HM6116 2k x 8 RAM chip were all mounted on a single PCB. The 146 bytes of additional RAM were located in the display driver chip. Needless to say, that the PC-1245 could use the same peripherals as the PC-1251: The CE-125 thermal printer and micro cassette recorder unit, the CE-126P thermal printer and the CE-124 tape recorder interface. Thanks to Roman von Wartburg and his site for information. This program will then be available in run-mode using , whereas the AREAD-command uses the already displayed value as input and assigns it to variable X. 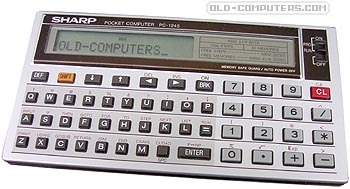 By this it is possible to use the PC-1245 in RUN-mode as a normal calculator and then use the result for a BASIC-routine. That is the main reason for me to have this nice little thing still on my desk. I could write books about it and all the fun we (friends in school) had with this thing. We used it to cheat in tests, used undocumented commands to make music with it and even programmed some games. see more Sharp PC-1245 Ebay auctions !